We know it was tough last night commuting across the Metro Rail system and we thank everyone for their patience and understanding. The system communications network issue has been resolved and Metro Rail today will have regular weekday service with some midday maintenance. On Wednesday evening at approximately 6:32 p.m. Metro Rail Operations reported a network issue resulting in limited communication throughout the rail system. 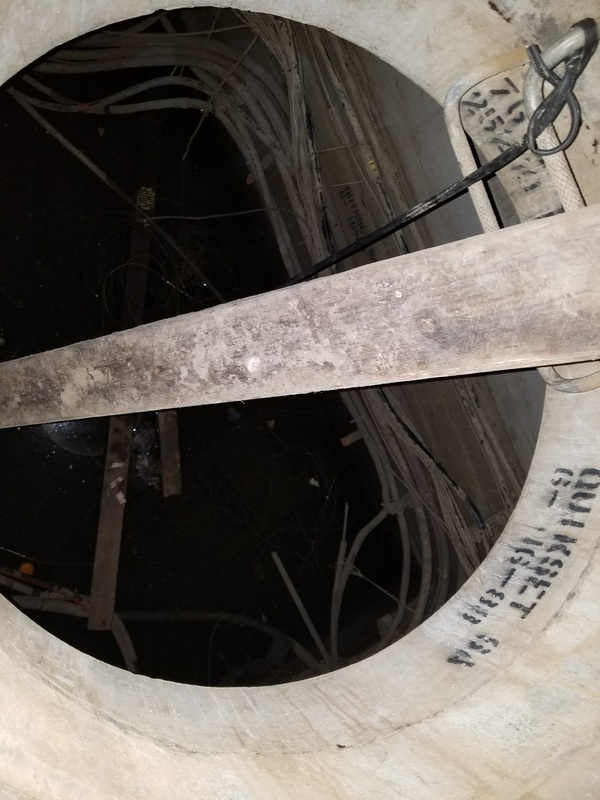 Officials later traced the disruption to 15 feet of clipped fiber optic cables in a manhole (photo below) under the Blue Line’s Slauson Station. Fifteen feet of “clipped” cables?! Suddenly, how/why did happen? I too would like to know “How?”. Not just “how” did the fiber optic cables get cut, but “how” does that bring down the entire system? Is there no redundancy or back-up system in place? To add to the fun, we received no info from the train operator. None. We just sat there at Venice/Flower for what seemed like an eternity (actually 20 minutes), waiting and seething. Lucky me, I was stuck on a train with a homeless man with an infected foot. The odor, with doors kept closed, was enough to bring tears to one’s eyes. While I don’t have an answer to your first question — I don’t know how our system network is set up and what it ties in to — I can let you know we’ll be working closely with our operations team to make sure operators know what they need to communicate to riders during these incidents. Knowing nothing of all this, I arrived at 7th Street/Metro Center at about 10:14 p.m. Wednesday (by Line 720 bus from an evening public lecture in Westwood). Over a year ago Metro already had slashed its Blue Line service southbound from 7th Street Sta. from six trains per hour to only three per hour (i.e., 20-minute headways) after about 8:30 p.m. nightly, so I was expecting to wait a while to meet the NEXT southbound Blue Line train scheduled to depart the station (at 10:30 p.m.). Under the circumstances some of us who had arrived at 7th St. very early for the 10:30 p.m. train found this early departure somewhat convenient. Still, imagine how unhappy Metro passengers who arrived at the station shortly after 10:20 p.m. would have been to have to wait almost 30 more minutes (until the next scheduled departure, at 10:50 p.m.) for a southbound train, instead of being able to take the train southbound at the scheduled time of 10:30 p.m.! As is typical of Metro, there was NO ANNOUNCEMENT on the P.A. system, either aboard the train or on the departure platform, as to why this southbound Blue Line train was leaving at 10:20 p.m. (i.e., either ten minutes late or ten minutes early). Whether the particular train-departure anomaly I experienced Wednesday night (an all-too frequent occurrence with Metro) was, in fact, related to this “limited-communication” problem belatedly reported (not until Thursday) in The Source remains, of course, unknown. Metro never responds even to written inquiries requesting an explanation as to why any such problem has occurred. The point is that, while passengers might be understanding that unexpected problems can arise with Metro’s train and bus service (though perhaps not why problems are so frequent), what is much harder to accept is that Metro seems to make very little effort to keep us informed in real time of exactly what problem currently is affecting Metro’s service–much less why, or (more importantly) when the problem might be expected to be resolved. Metro seems committed to the discredited “Mushroom Theory” of public information–keep us in the dark and feed us . . . [fertilizer]. Its not just the train operators who do not communicate when there is a problem. Twice in the last month I was on an Orange line bus that broke down. The drivers just stopped the bus and never said a word. Luck for the passengers both buses were able to limp into the next station.You need to train your drivers in customer service.